Administration leadership in security positions are dropping like flies. A comment at TPM tells the story. This article just out from CNN suggests that behind the scenes over recent weeks Trump has been insisting on various immigration crackdown policies that would in many case clearly break the law. It sounds like that is what got Nielsen fired, though not in an honorable way. If CNN’s report is to be believed, she was willing to kinda break the law, just not do so as much as Trump wanted. We have a completely lawless president. He's given up even putting a fig leaf on it. Trump is just being Trump and the law has never applied to him. I think a good strategy for 2020 would be attack ads on Steven Miller. He's ultimately the one making most of the "policy" decisions (using the term very loosely), and he's a thoroughly unlikeable person with little in the way of redeeming qualities. Plus if the ads say that Trump is just Miller's puppet, that will no doubt induce some loose cannon behavior. Trouble with that is that MSM can only do the obvious. Nuance doesn't sell. They made their bed, now we all have to lie in it. What I would give for a better BBC. I go there from time to time during commercials, and they are like totally 80s or 90s. I mean, their graphics and sets are archaic, as are the pacing. It makes it hard to stomach. Imagine if there was a professional version. Folks like us would flock there. The dead hard Trump folks will think that is a pro-Trump ad. The Trump curious may not care at all because the "economy is doing great" and Trump hasn't been hauled off in cuffs so he can't be all bad. 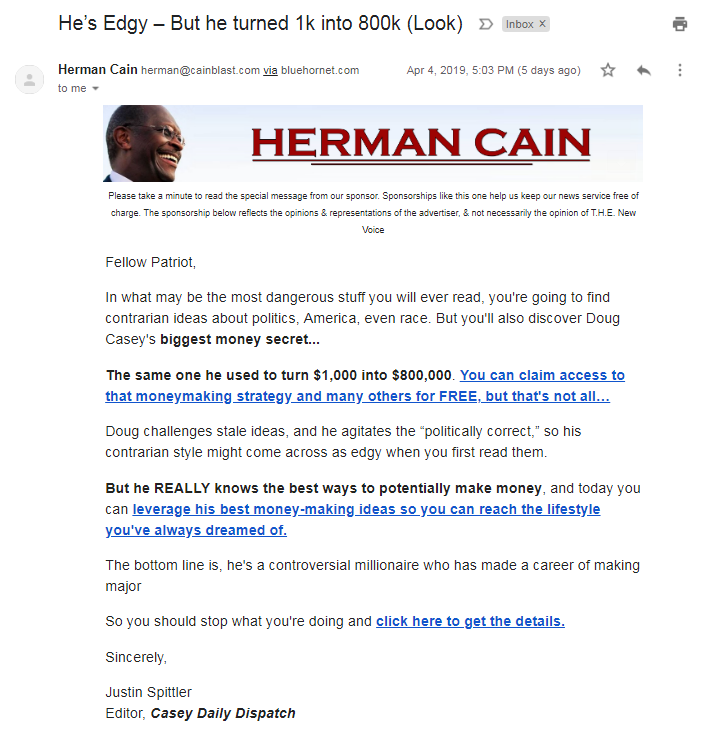 Herman Cain, who Trump apparently wants to put in the Federal Reserve, has a history of sending get rich quick scams to his email list. Is it any wonder Trump loves this guy? They two "pees" in a pod. Per Media Matters, Cain also has a history of promoting “penny stocks” to his email readers, small shares that are easily manipulated by promoters and manipulators. One Republican Senator has a shred of decency ... for now. We'll see what happens if he actually has to make a public vote. Sen. Pat Roberts (R-KS) seemed to forget that “on the record” rules apply no matter voice volume when he whispered his opinion on former Kansas Secretary of State Kris Kobach’s viability for one of the now-open DHS slots. “I never said that to you,” Roberts added hastily. Amid the many vacancies left by President Donald Trump’s purge of the department, Kobach’s name has been floated as a possible replacement for ousted DHS Secretary Kirstjen Nielsen or maybe nixed ICE chief nominee Ronald Vitiello. However, the general thinking seems to be that Kobach has no chance of getting through a Senate confirmation process. Mick Mulvaney dubbed most dangerous man in Washington ... by a Republican Senator. I wonder how much Putin is paying him. During weeks of strained debate between parties while the government was shut down for a month earlier this year, tensions were high — and one Republican senator accused acting White House Chief of Staff Mick Mulvaney of continuously derailing negotiations, The New York Times reported. In an article about Mulvaney’s management style — letting President Trump be Trump — the Times reported that Sen. Richard Shelby (R-AL) “complained bitterly” about Mulvaney’s habit of “undoing weeks of bipartisan work with a quick comment to Mr. Trump in the Oval Office,” in the Times’ words. Shelby reportedly told Sen. Patrick Leahy (D-VT) that Mulvaney was the “most dangerous man” in Washington, three people familiar with the conversation told the Times. FIFY. Not as dangerous as the crime boss he works for, or the capo Big Turtle in the Senate. It seems like Mr Trump is assembling the Trump Organization in DC. Those who are still around are loyal to Trump. He purges those that don't perform as he wishes or whom he suspects is not loyal. Another one of Trump's best people. Whenever President Trump nominates someone to take over for whichever administration official was most recently forced to leave office, ethical concerns about the successor are soon to follow. But it’s unlikely anyone has been investigated as quickly as David Bernhardt. On Thursday, the former oil lobbyist was confirmed as Trump’s new Secretary of the Interior. On Monday, the department’s inspector general launched an investigation into ethical concerns that have been swirling since he took over as the department’s deputy secretary in August 2017. The investigation comes after a group of Democratic senators and multiple ethics groups appealed to the Interior Department’s IG to look into Bernhardt’s conduct. On Monday, Deputy Inspector General Mary Kendall wrote the senators to announce she had opened an investigation based on “a wide assortment of complainants” alleging “conflicts of interest and other violations.” She added that their complaint was one of seven she had received regarding Bernhardt’s conduct. Dream on. When was the last time McConnell's Senate refused to confirm a Republican? Any Republican?